Obviously inspired by the Icelanders are NOT Terrorists! campaign, which highlighted just how inept and internationally embarrassing Gordon Brown and his henchman Alistair Darling's mis-handling of the Icelandic banking crisis, there is now another protest against this Labour government and its army of jobsworth apparatchik bureaucrats, who are making life hell for ordinary, law abiding photographers (i.e.most of the general public) , under the spurious pretext of "security theatre" / Climate of Fear. This campaign blog also has a Bust Card for photographers to print out and carry, with some handy legal advice for Photographers (and for the very confused and poorly trained Police on the streets etc. ), which is being improved through the comments. N.B.they should also print out the 24 hour contact details for some firms of solicitors experienced in criminal and human rights arrests, criminal charges and legal appeals etc. since, iIf you are harassed and then arrested, you will probably no longer have access to your mobile phone or PDA electronics contacts address book.however , the Police will probably be snooping through this and copying it "for intelligence" purposes if they can. Continue reading I'm a Photographer Not a Terrorist !. Andrew Miller (Ellesmere Port and Neston) (Lab): Can I seek an assurance from my right hon. Friend that the circumstances that led to the photographs being taken in Downing street do not lead to further pressures on the rights of photographers, both professionals and amateurs, to take photographs in this country, especially as this event coincided with an incident in the past few days where somebody was allegedly challenged by a police officer for taking photographs of a bus garage? We need to learn lessons from the event and draw together the common-sense work being led by my hon. Friend the Minister for Security, Counter-Terrorism, Crime and Policing to come up with the right code of practice to ensure that photographers can do their jobs and amateurs can take photographs with freedom. limits result from recent legislative changes that we have made, as has been suggested. There is more work that we can do to ensure that photographers are clear that their right to take photographs is protected in all cases where it is not causing a specific risk. That is certainly a right that my hon. Friend and I would uphold. These weasel words from Home Secretary Jacqui Smith provide no clarity or leadership about who or what may, or may not be photographed. What is she doing to discipline or prosecute those Police Constables, PCSOs, and private security guards etc. who harass innocent photographers and tourists ? NUJ video - Press Freedom: "Collateral Damage"
The National Union of Journalists has today released a press release and an online Flash video, which gives a glimpse of the deliberate targeting of even fully accredited media photographers who are covering political protests and dissent in the UK. 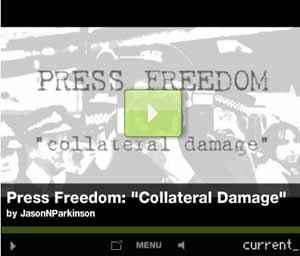 The nine-minute video, called Press Freedom: "Collateral Damage", includes examples of the police obstructing journalists in their work. N.B. this is not a directly embedded Flash video object, which otherwise would act as a web bug, effectively allowing the Flash video hosting site, and whoever is snooping on them, to track visitors to the Spy Blog website, even if they are not actually interested in watching the video. This film features Jeremy Dear, the General Secretary of the NUJ, who has tried to engage with the Home Secretary and senior Police chiefs over this matter, seemingly with little effect, and the photojournalist Marc Vallée, who was knocked unconscious and hospitalised by the Police whilst covering a demonstration in the Serious Organised Crime and Police Act 2005 Designated Area around Parliament Square. As the video says, there are no laws preventing the Police from taking photographs in public, just as there are none which prevent professionals or members of the public from doing so either. If professional photographers, who regularly document political demonstrations and protests feel intimidated, then what about the "chilling effect" on the freedom of members of the public who might try to snap a picture on their mobile phone or digital camera , now that there are Government and Police propaganda campaigns which demonise street photographers as if they were all terrorist suspects ? The targeting and harassment of photographers e.g. "we know your name" etc. is more than just overzealous individual policemen, it seems to be a deliberate policy. What is this Police surveillance footage and other data e.g. mobile phone Communications Traffic Data), which is not taken as evidence of acts of violent public disorder actually being used for ? Who has access to this data ? When, if ever, is this surveillance data destroyed ? Is it it all just a waste of Police manpower and public money ? The Home Office and the senior Police management need to stamp out this public and community relations disaster, which is just creating contempt, fear and hatred of the Police and the Government..
Sunday Telegraph magazine article on the harrassment of photographers by jobsworths - time for a bit of sousveillance ? Has our increasingly paranoid society declared war on the humble 'weekend snapper'? This article brings together first hand and other recent reports of illegal harassment of innocent photographers, by private sector security guards, by Police Community Support Officers and even by supposedly fully trained Police Constables, all of whom are flouting the law, not only by demanding that photography should cease, or that photos should be deleted, but also in some cases by demanding "ID". All of this is illegal, but normal law abiding members of the public are often intimidated by the fluorescent jacketed officious jobsworths. Would anyone be interested in joining in with others in a bit of Sousveillance to name and shame some such jobsworth little hitlers ? Meanwhile, we are still awaiting the results of a Freedom of Information Act request, originally to the Home Office, now being dealt with by the Ministry of Justice, regarding exactly where it is actually illegal to take photographs in, of, or near "sensitive buildings" which have been designated as Prohibited Places under the Official Secrets Act 1911. This is not at all clear, given that even some Government and Military buildings are no longer actually owned by the Crown, or have foreign based owners, due to various Public Finance Initiatives and tax avoidance schemes by property developers. 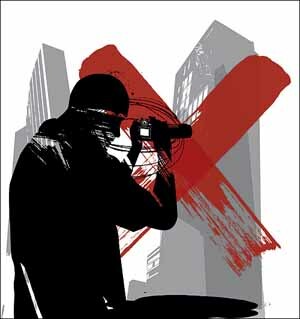 Photographic Surveillance in public can be, and is, used deliberately as a legal harassment technique, both by Police Forward Information Teams (who may sometimes be civilian photographers / videographers) and sometimes by their opponents e.g. Fit Watch. According to the British Journal of Photography (NJP), back in May, the General Secretary of the the National Union of Journalists *NUJ), Jeremy Dear, wrote a letter to the Home Secretary, complaining about such harassment, even of Press Card accredited journalists and press photographers. He also staged a "one man protest" outside of New Scotland Yard, the Metropolitan Police HQ in London. It seems that the Home Secretary Jacqui Smith has replied, with even more evidence that Britain is a "surveillance society", where basic freedoms are being curtailed, not just through the law, but by administrative policies. Local restrictions on photography in public places are legitimate the Home Secretary has stated in a letter to the National Union of Journalists. While Jacqui Smith reaffirmed that there are no legal restrictions, she added that local Chief Constables were allowed to restrict or monitor photography in certain circumstances. The letter dated 26 June, which BJP has seen a copy of, is in response to correspondence sent by the Union secretary general, Jeremy Dear, who expressed concern at police surveillance of journalists, in particular photographers. However, the Home Secretary adds that local restrictions might be enforced. 'Decisions may be made locally to restrict or monitor photography in reasonable circumstances. That is an operational decision for the officers involved based on the individual circumstances of each situation. Under what law is such an "operational decision" to be made ? Are these decisions to be made in secret, so that the public does not know when and where and for how long such restrictions are in place ? The evidence of the illegal secrecy surrounding the supposedly temporary, time and location limited Terrorism Act 2000 section 44 stop and search without reasonable cause powers, leads us to believe the worst of the Home Secretary. 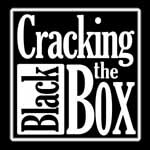 HO Terrorism Act 2000 s44 Authorisations and HO Prohibited Places - Official Secrets Act 1911 blog category archives. This shows how reflexively authoritarian and bureaucratically secretive the NuLabour government is, even when there is no practical reason for them to be so. Continue reading Home Secretary Jacqui Smith: "no legal restriction on photography in public places", but supports legal harassment of photographers. Restrictions on Photography in Public - where are the "Prohibited Places" designated under the Official Secrets Act 1911 ? There are also ongoing "Climate of Fear" propaganda campaigns, which seek to make innocent public photographers or mobile phone users into terrorist suspects. See Photography does NOT equal Terrorism"
It is worth remembering, however, that there are actually some places where photography is illegal. Section 1 of the Official Secrets Act 1911 makes it an offence for any person for any purpose prejudicial to the safety or interests of the state to approach, inspect or be in the neighbourhood of a 'prohibited place' or to make or otherwise obtain a sketch (a term which encompasses a photograph) which might be directly or indirectly useful to a potential enemy. All Government Communications Headquarters sites are prohibited places for the purposes of the Act. This Labour Government abuses the supposed Parliamentary legislative safeguard, of having a Secretary of State personally scrutinising and signing an Order, or having to be Notified of a Request, to suspend normal laws, in a narrowly defined geographical area, on a temporary basis only, which they, as our supposedly democratically elected representatives have the power to Authorise, Amend or Refuse or Revoke. 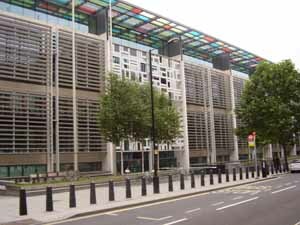 They have demonstrated this abusive preference for general repression through Kafkaesque secret laws, which the general public cannot know whether they are being applied in a particular place, at a particular time or not, by their refusal to list when and where Terrorism Act 200 Section 44 stop and search without reasonable suspicion powers are or have been in force - see Home Office Terrorism Act 2000 s44 authorisations FOIA request correspondence archive. We wonder if the Government will, in its usual secretive manner, also attempt to keep secret, what is already known to our enemies and allies through aerial and satellite reconnaissance i.e. the locations of such "Prohibited Places". Perhaps it is time for another Freedom of Information Act request. Continue reading Restrictions on Photography in Public - where are the "Prohibited Places" designated under the Official Secrets Act 1911 ?.